About Fabio D. Message Fabio D.
We spent 5 hours with Fabio touring Sao Paulo. Though we usually tour cities on our own, we were only in the city for a single day, and we knew there was no way we could see much on our own in such a short time. Fabio is a smart, knowledgeable guide. His English is good and he knows a great deal about the city. He was good company for the day, and we feel that we got as much of the flavor of the city as possible in so short a time. TOUR GUIDE RESPONSE: Thank you Michael, you and Andrea help me a lot to make the tour better. You both were very kind to me and was a pleasure to spend 5 hours with you. Best regards for you both. Fabio did everything possible to make our tour the best t could be under terrible rainy circumstances. He was exceptionally attentive and helpful. The tour was far superior to the comparable tour offered by our cruise ship. A woman on the ship's tour commented that Fabio was far better at explaining the Coffee Museum in Santos, than the cruise ship guide. Thank you, Fabio. TOUR GUIDE RESPONSE: Thanks Joyce for the kind words, for me it was a pleasure and the rain certainly complicated our tour, but with your optimistic spirit and behavior, it was a great tour. I hope everything is fine with you, your husband and friends, thanks again. The tour was very nice and Fabio is a very kind person. He is well informed and has a good knowledge of the area, he made great suggestions and showed me perfectly around. TOUR GUIDE RESPONSE: Hello Jana, it was very nice to meet you and your mother that were really kind with me. For me was e real pleasure to do the tour with you. All the best for you both. My guide was prompt, personable, well informed, and easily able to explain history and culture in São Paulo. It was a very pleasant day!! Fabio provided a wonderful tour. He was knowledgeable, attentive, pleasant and extremely accommodating. He was prompt and provided a comfortable cool vehicle in stiflingly hot weather including a bottle of cold water for each participant. I recommend him highly without reservation! Great tour, we can only recommend! We had 5 hours to cover after an overnight flight and the check-in to our apartment. Fabio was really flexible as our flight was delayed. The option to keep our luggage in the car saved us a lot of time. After the tour, we had a great overview of the city and looking forward to explore all tips received from Fabio! Thanks again. TOUR GUIDE RESPONSE: Thank you Beat, it was a pleasure to show São Paulo to you and your friends who were really kind to me. Hope you have a great time here in Brasil with the other trips you will do. All the best for all of you. Fabio was a perfect guide. He was flexible in starting and ending the tour as one colleague was delayed due to the traffic situation. Fabio's knowledge is impressive and we enjoyed the tour. We recommend him and the tour. TOUR GUIDE RESPONSE: Thank you George, it was a pleasure, you and your colleagues were very nice with me. I hope you enjoyed the football match you went that night. All the best for all of you. TOUR GUIDE RESPONSE: Thank you Mr Michael, all the best for you here in Brasil. TOUR GUIDE RESPONSE: Thank you Mr Robert, it was a pleasure. All the best for you. A great tour! Our guide Fabio was flexible, knowledgeable and fun! He was able to easily modified the tour to fit our interests in Sao Paulo while still keeping us on track. My partner and I are foodies and history buffs - Fabio took the time to answer our history questions about his amazing city including giving us tips on the best museums and sites. We ended the tour with delicious food at the Municipal Market. If you're coming to Sao Paulo, Fabio is the guide you want. Thanks again! Obrigado novamente! TOUR GUIDE RESPONSE: Hi Keith, thank you for your kind words and I am very happy you enjoyed the tour and the tips I gave you. All the best for both of you. Fabio was right on time, gentle, patient, and knowledgable. We had a long layover, so he took my family and I on a tour of Sao Paulo highlights. Our group included a 3 and 5 year old, and my 75 year old father. Fabio was thoughtful about our limitations. We had a very nice time and Fabio made what could have been a hectic visit very easy and pleasant! TOUR GUIDE RESPONSE: Thank you for the very kind words. Your family helped me a lot because you are lovely people. I am very happy that you liked the time you spent here with me. Hope you had a great time in your trip after you left Brasil, and I wish all the best for everyone of your family. Fabio was prompt in his arrival and we were off to Sao Paulo. It was a wonderful drive with beautiful purple flowers along the highway. Mom (who uses a wheelchair) opted to stay in the car and Fabio and I did any walking. As it was now lunchtime, we asked to be taken to a local spot. It was great food and it had a little bakery inside so i was also able to pick up some treats for my co-workers. Fabio was very knowledgeable and an awesome guide--thanks for your hospitality and showing us your city!!! TOUR GUIDE RESPONSE: Hello Maura, thank you for your kind words. It was a pleasure to show my city to you and your mother, who is very friendly. For me, it's a happiness that you like. I hope you had a wonderful birthday with your trip to the Amazon. I hope you two are really well. I wish you the best. Fabio is a very nice, friendly Guide. He knows a lot about Sao Paulo. His english is exellent. He was on time in our hotel to fetch us. Had great 5 hours with him. After the tour, Fabio droped us a the airport. GREAT GUIDE!!!!!! TOUR GUIDE RESPONSE: Thank you Verena and Hans, you both are very kind people and I also liked the tour very much. Hope you had a good trip back to South Africa. Kind regards for you. Fabio is a fantastic guide. Very well spoken, his english is very good and knowledge of the city, history, culture and sights was perfect. Fabio curated the tour to our taste with patience and effort. I highly recommend him. Fabio did a fantastic job bringing us from São Paulo to Ilhabela. He is an excellent driver and guide, and has very good English. He went above and beyond the call of duty to suit our needs making sure the trip was as special as possible, filling us in on the history of the area as well as choosing just the right place for lunch. He is both good company and flexible in his approach so an ideal person to be with when touring this busy but beautiful part of Brazil. TOUR GUIDE RESPONSE: Thank you Orla, it was a pleasure for me to make this trip with you and your husband. It was very easy for me because you two were very nice to me and I really like to go and see the coast of São Paulo that we have many places to explore. I hope you come back as soon as possible to see you and to show other places on our coast, especially for you who enjoy Brazil so much. All the best for you both. Enjoyed the tour immensely! Fabio is a great guide, very knowledgeable and relaxed. Very responsive to needs and hospitable. Will recommend him to anybody without any doubts! 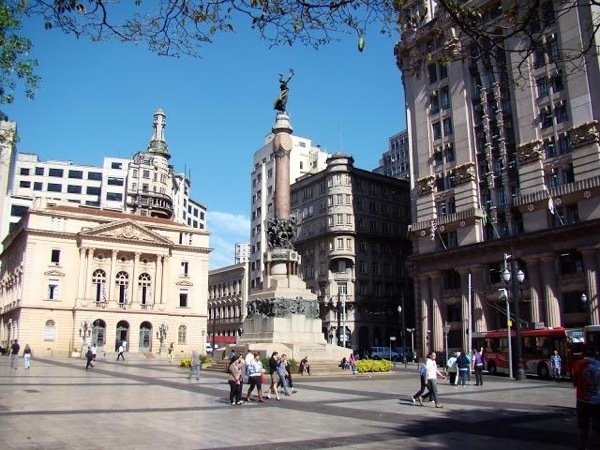 TOUR GUIDE RESPONSE: Thank you Mr Schalkwyk, I am very happy and proud that I could showed you my city in your fast visit you made here at São Paulo. I wish all the best for you. Fabio's tour was amazing, we had 6 hours of pleasure touring through so many interesting parts of Sao Paulo. His knowledge is extensive and he's an incredible tour guide. I strongly recommend his tour. Thanks so much for a fantastic day, Fabio! TOUR GUIDE RESPONSE: Thank you Melissa, you and your friend Facundo helped me a lot because you both were very interested to know the history and some particularities of São Paulo that my job became easy and pleasure. I hope that I had could help you to discover a little bit more of São Paulo by yourself the next days ahead you still have here. All the best for both of you. Fabio provided us a great tour to Santos, providing a lot of great information! My son, wife, and I had a great time. We were able to stop and take some absolutely breathe-taking pictures. The coffee museum and church in Santos were great stops. After taking some more pics from another overlook, we enjoyed a great lunch on the beach and enjoyed some time in the sun before heading back to SP. Thanks for making our trip to Brazil fantastic Fabrio!! TOUR GUIDE RESPONSE: Hello Christopher. Thank you and your family to make my job pleasant and easier. Your son is a very polite boy and you and your wife were really kind with me. I am very happy that I could do your trip better. I hope to see you next time you come back to Brasil. All the best to you. We really enjoyed our half day City tour with Fabio. He picked interesting and varied sights and had lots of information and stories about the City. He was flexible to our interests and made sure we had several places to walk around. He managed our time perfectly and was helpful figuring out where to find practical things like currency exchange. We loved the visit to the market. He was open to answering all our questions. Highly recommend Fabio. TOUR GUIDE RESPONSE: Thank you Mr David, I enjoyed the tour too. You and your wife Catherine were very kind to me and made my job really easy and pleasant. All the best for both of you. Thanks a lot. Fabio was right on time to meet us at the airport and easy to find. The drive into Sao Paulo was quick and interesting. His car was clean and comfortable. Fabio gave us good information and tips on how the city. TOUR GUIDE RESPONSE: Thank you Ms Elaine, your group was very kind with me, I liked the tour too and I am very happy that you enjoyed the suggestion I gave to you. Best regards to you, your husband and friends. I hope you will enjoy Rio de Janeiro. TOUR GUIDE RESPONSE: Hi Michael, I'd like to thank you and your friend for being so kind to me and I also enjoyed the tour we did, you've had so much interest in the city that my work has become easier. This was the second tour designed by Fabio in consultation with me before we arrived. We had limited tome in Sao Paolo and wanted to have a look away from the city. Fabio arranged a terrific five hour tour, he took us through many different districts of Sao Paolo and explained about the housing, the economy and the history of the areas. Eventually we arrived at the National park on the fringe of the Atlantic rainforest. He too us to the best scenic spots with stunning view. TOUR GUIDE RESPONSE: Thank you again Mr Ian, we got lucky because we could see a big group of monkeys, they passed in front of our car when we were coming down the mountain where we had an amazing view of São Paulo, from Jaraguá Peak. It was a nice experience for me too, because is not easy to see Monkeys in the nature inside the city of São Paulo, just 40 minutes from Downtown. I hope after we found the pharmacy and you took the medicines you felt better to enjoy your cruise. All the best for you and Ms Jane. This tour was a success from beginning to end. After some unrewarding attempts to arrange this tour with a different guide I contacted Fabio. He was immediately understanding of our needs and did everything possible to fulfil our wishes. On the day of the tour he arrived punctually. The car was appropriate and clean. It came stocked with cold water. Every step of the tour was conducted in a well informed and professional manner. TOUR GUIDE RESPONSE: Thank you Mr Ian for your words, I also liked to do the tour with you, Ms Jane and your 2 friends, you all were very kind to me and with people like you everything became easier and nicer. I hope you come back to Brazil soon and I will be ready to help and show another amazing spots of São Paulo. All the best for you and Ms Jane. Fabio took us on a tour of Santos and Sao Paulo while our cruise ship docked in Santos. We took an extensive tour mainly of Sao Paulo. Fabio was very knowledgeable of the history of both Cities. This discussion included todays political situation and Sao Paulo's standing within the State of Brasil. He seemed to know every building in Sao Paulo and its history. The highlight was a light lunch at the market. In Santos he showed us an unique facility, a cemetary in a highrise. It was a most enjoyable day. TOUR GUIDE RESPONSE: Thank you Mr Dieter, you and your wife are very kind people and I am very happy that you enjoyed so much the Tour. For me was a pleasure to show places that I like a lot and I wanted to share the knowledge about my City with you both. Pleae, send regards to Ms Chris too. All the best for you!!! Our tour guide Fabio was friendly,professional and knowledgeable.He was super flexible with our 19 people group so we had a good time and covered a lot of interesting places during the tour.The tour was excellent.Amazing guide (!!!) From group 19. TOUR GUIDE RESPONSE: Thank you Julie, you and your group were incredible and very kind, which made my job become easy. Please send my regards to all members of your group.